Dissolve honey in the warm water and then mix in the yeast. Leave for 10 minutes to bubble. In a large bowl, lightly beat the egg with milk then add in the melted butter. Make sure that the butter is not hot to prevent the egg from scrambling. Pour the yeast mixture into the bowl and mix until just combined. Sift the bread flour into the mixture then add the 1 cup of wholemeal flour. Stir to combine. Tip off the content of the bowl onto a floured surface (using wholemeal flour) and start mixing with your hand. You will need to add in more wholemeal flour gradually as you attempt to knead the dough. Knead for 5 to 10 minutes. Once the dough bounces back when you press on it, it is done. Grease the bowl that you used earlier with some olive oil and place the dough inside the bowl. Cover with a damp towel or cling film. Leave it to rise for 1-1/2 hours in a warm place. Once the dough has doubled in size, punch down on the dough then transfer the dough on the work surface and knead slightly just to shape. You may also make it into rolls or burger buns by dividing the dough into small balls. Grease a loaf pan with butter or oil and place the dough in the pan for a second rise. Leave it to proof for 30 to 45 minutes. Heat the oven to 175 degrees Celcius. 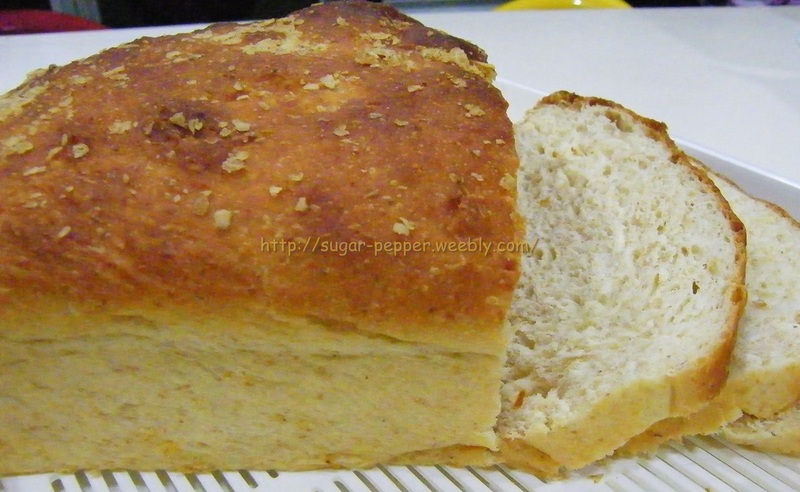 Brush the top of the loaf with the melted butter and sprinkle the oats or grain on top. Bake in the preheated oven on the middle rack for 25 to 30 minutes. It is done if it sounds hollow when you tap the bottom of the pan. Once done, remove from the oven and leave it to cool for a few minutes before transferring on to a wire rack to cool completely. Delicious eaten when still warm but still wonderfully soft the next day! P/S : For those who are more health conscious, you could substitute the butter with olive oil, omit the egg and increase the milk to 1/2 cup. You could also use all wholewheat flour, but the bread will be quite dense.